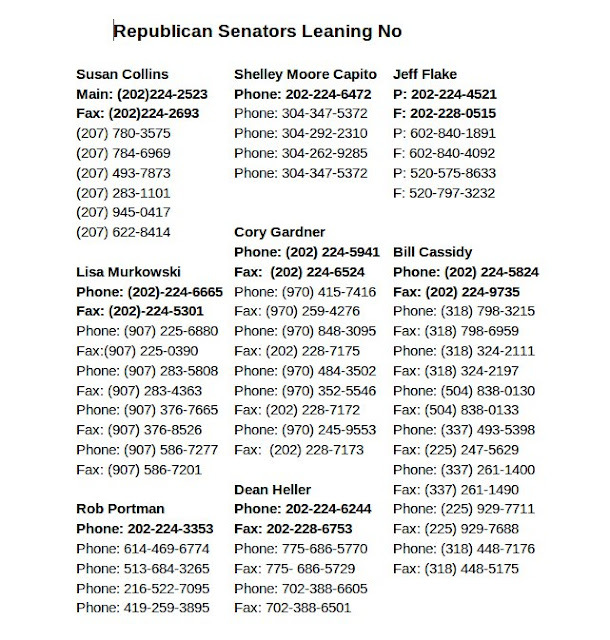 Speed of Life: Have you called your Senator today? 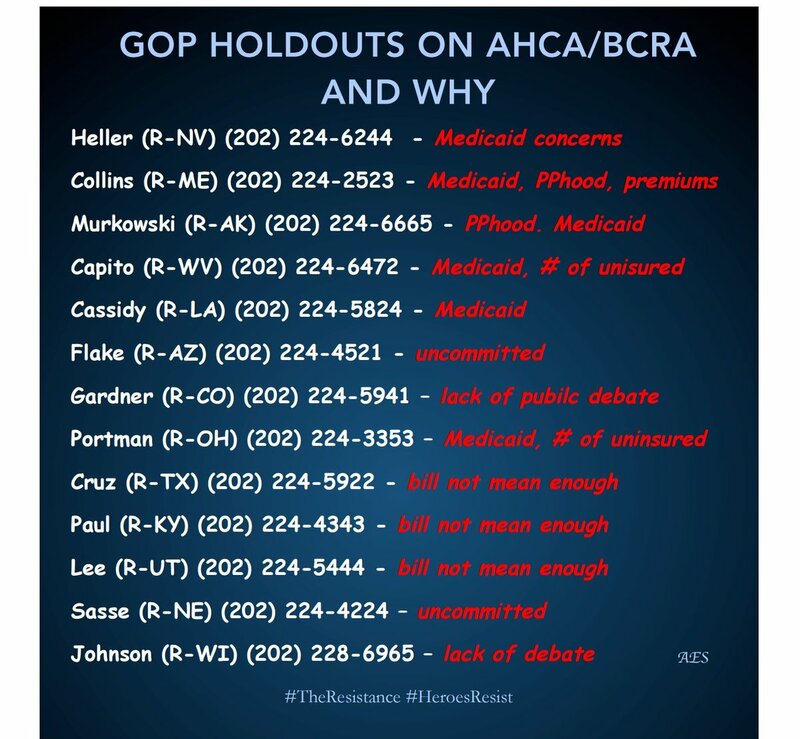 Tell them NO on Trumpcare! 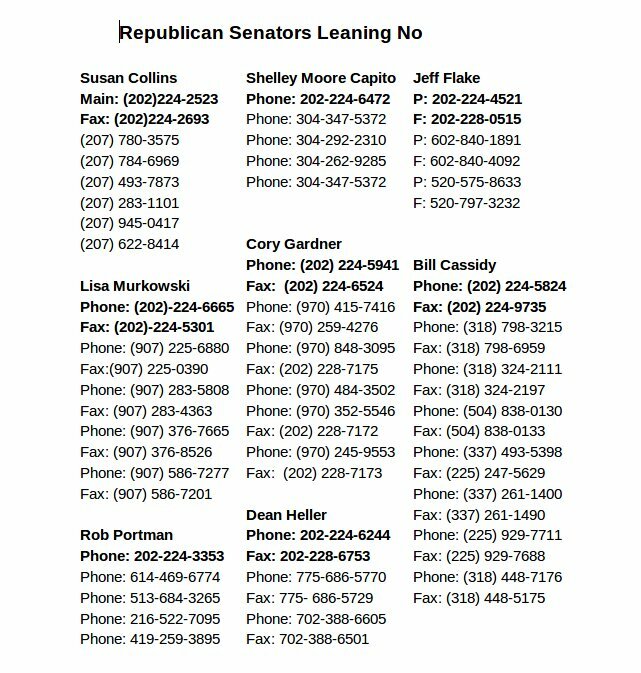 Have you called your Senator today? 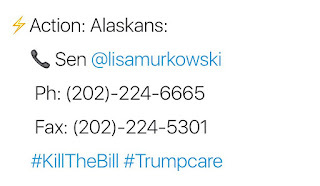 Tell them NO on Trumpcare! On June 27th, I posted a criticism of the GOP led Senate's horrific proposed healthcare legislation. Their bill is back with a few revisions and it is just as awful as before. The New York Times reports that, "The revised bill is broadly similar to the earlier measure that Senate leaders hoped to vote on before the Fourth of July recess, though the new version includes some additional provisions meant to entice reluctant Republican senators with varying policy concerns. Like the previous bill, it would end the requirement that most Americans have health coverage, and it would make deep cuts to Medicaid, capping payments to states and rolling back its expansion under the Affordable Care Act. Though some Republican senators expressed concern about how the previous bill would affect Medicaid, Senate leaders stuck with the same approach in the new version." Also, the proposed new bill would allow insurers to offer substandard insurance packages that were not allowed in the ACA. McConnell is trying desperately to recruit “moderate” Republicans that are holding out, but he also needs to get the extreme rightwing to support his bill. That’s why he’s pushing a proposal from Senator Ted Cruz that would allow insurance companies to sell plans that have fewer benefits and fewer patient protections than plans currently sold through the health insurance marketplace do. They’d be allowed to do this as long as they sell just one plan that complies with the ACA’s protections. Health insurance that does not meet minimum standards would be disastrous. People with substandard policies will of course turn to emergency rooms looking for care which will flood and destabilize hospitals. These enormous costs of treating the under-insured will be passed along to all of us in higher medical costs and higher insurance premiums. "People with pre-existing conditions, especially middle-income families who don’t get tax credits, will have no choice but to pay higher costs in order to get the plans that cover them. This could also create serious confusion for customers buying through the exchange when trying to understand which plans cover the services and prescriptions they need-- and which do not. The ACA created standards for what qualified as health insurance and this proposal tears those standards away." Senator McConnell hopes to hold a vote on what many are now calling Treasoncare next week. There have been zero public hearings on healthcare repeal in the Senate. The GOP is looking for any excuse to support this bill and claim it’s been fixed. Let’s be honest, this bill is unfixable. This is an historically partisan, secretive, and undemocratic process for one of the most consequential pieces of legislation of our generation. The Congressional Budget Office analysis of the bill's financial impact and how many people would lose insurance must is expected Monday. This is atrocious. So let’s fight it! As the husband of a cancer survivor I ask those who support Trumpcare- "How can you help pass legislation that you know will kill people? Where is your compassion? Where is your humanity?" As Indivisible writes,"We are under no illusions that victory is assured here, but victory is possible. Every member of Congress voting on this bill will eventually have to get your vote to be reelected. That’s the source of your constituent power. That’s what makes them responsive to pressure. Remember in March when Paul Ryan embarrassingly called off his first TrumpCare vote? That happened because of public pressure. That happened because of you." The 2018 elections are not far off. Several GOP senators, including Susan Collins of Maine, Dean Heller of Nevada, and Senator Shelley Moore Capito of West Virginia have made it known that they did not support the bill in its first form. 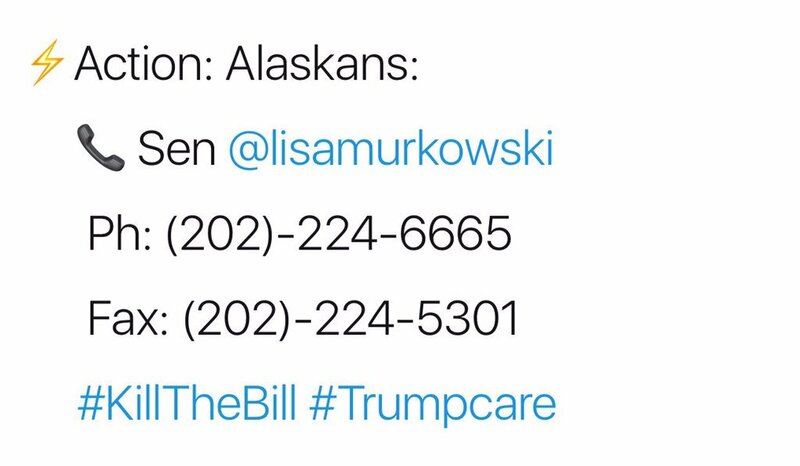 For the sake of our nation's future, voters across the country and especially in Alaska, Maine, Colorado, Nevada and West Virginia need to call their Senators and demand a NO Vote on the healthcare bill. Remember - health care is a winnable fight. We’re not going down. Let’s stand together. Let’s win this. Today, let Senator Heller know you oppose TrumpCare and this new Cruz proposal. Caller: Hello! My name is [name] and I’m calling from [part of state]. I’m calling to thank Senator Heller for announcing his opposition to TrumpCare. This bill would be terrible for Nevada and terrible for our country. I’m very glad he’s decided to oppose it. Staffer: Well thanks so much for calling. Caller: Senator Heller needs to continue opposing the TrumpCare bill, no matter what. There’s nothing he can negotiate with Mitch McConnell that would make this bill something he should support. I’m also strongly opposed to the new proposal from Ted Cruz regarding what kind of plans can be sold in the marketplace. Do you know if Senator Heller supports that proposal? Caller: That proposal would make things even worse for people with pre-existing conditions. It says that insurance companies can sell whatever plans they want -- no matter how low-quality they are -- as long as they sell just one plan that meets the ACA’s standards. That is a waste of taxpayer dollars because it means people will use tax credits to buy plans that don’t cover anything. And even worse, it means prices will go way up for people with pre-existing conditions, including 439,000 people in Nevada. Staffer: This bill protects people with pre-existing conditions. Caller: That’s not true. The bill allows states to let insurance companies sell plans that don’t cover essential health benefits, meaning people with pre-existing conditions won’t be able to get the care they need. And the new proposal from Ted Cruz makes it even worse. Someone who is in the middle class and doesn’t qualify for subsidies likely wouldn’t be able to afford the coverage they need because of the Cruz proposal. How could the Senator support that? Staffer: The Senator is waiting for a new CBO score to make a decision on the bill. CBO is scoring the bill with the Cruz proposal and without it. Caller: I see. Well I want Senator Heller to oppose this bill whether it has the Cruz proposal in it or not. There is no change -- not extra time, not extra funding, no policy tweak, and definitely not this Cruz proposal, that could make this bill something Senator Heller should support. Staffer: I’ll be sure to pass along your thoughts to the Senator. Caller: Thank you. Please take down my contact information so you can let me know how the Senator decides to vote on this bill. 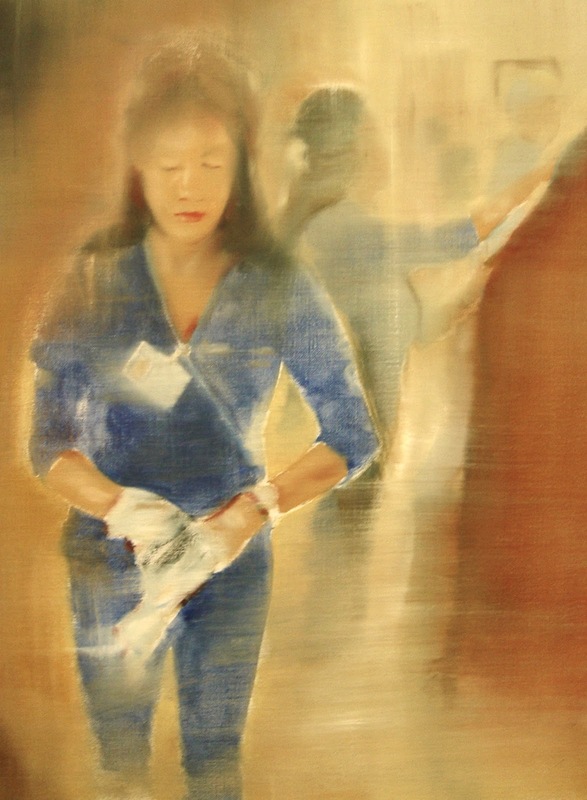 Soumya Karlamangla in the Los Angeles Times reports that,"The Affordable Care Act had a huge impact in California. 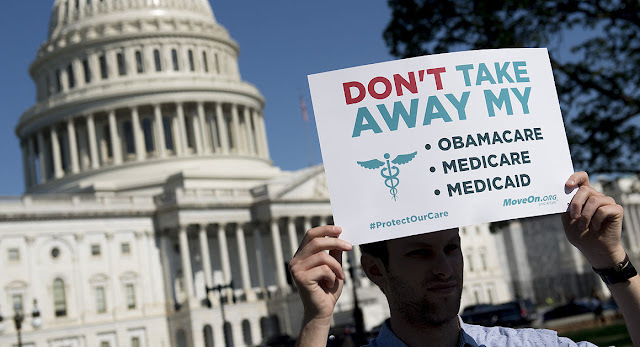 The percentage of uninsured in the state dropped from 17% before the law went into effect to 7% last year, the lowest rate ever, according to data released this year by the U.S. Centers for Disease Control." 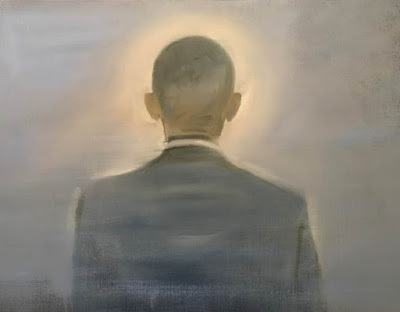 Noam N. Levey in the Los Angeles Times writes,"The coverage losses in the Senate bill would completely reverse historic gains in recent years under Obamacare. Over the last four years, the share of people without coverage in the U.S. has been cut in half, dropping to the lowest levels ever recorded, data show." This is a raw moment for so many of us who have pre-existing conditions or who have children or family members who would be directly harmed by Trumpcare. My wife is a cancer survivor whose family is from Wisconsin, where over 400,000 stand to lose coverage if Trumpcare passes. Make no mistake - this is real, and this is scary. But we also know that we’ve succeeded for months because groups across the country have been fighting back on their home turf. The "new" Republican health care bill is still a disaster.